I was sent 32 games from the Hamilton Congress. (rounds 2-6 from the top five boards). they could get downloaded from the Chess Scotland site. (The things I do just to get my hands on a few games). I have selected 4 interesting games to show you. intending to play a Pirc set up, to attack down the h-file. and 'tempted' Black to go for it. Thank God for Andrew Burnett, his games cheer up any Chess column. saw it and again thought he could he could handle it. And he could have. When I first played this over my gut was telling me this was wrong. In this position Black played 21...exf4? and it was all over. 21...Kf7 and White still has to prove it. I can find no clear win. This and the previous game help prove what I've always said. "It's easier to attack than defend - sac and wait for the blunder." c4 as a staging post to triple up on the a-file. White was mesmerised by the whole idea and played along with it. not threatening Bb2 and Bxc3 because of Rc1 pinning & winning. along to f3 & g3. off 'cheap shots' when they are in positional mode and have a plan. White should have been thinking along these developing lines. inactivity in these situations against a reasonable player is doomed. set up a counter attacking position, defending c3 from active squares. Either that or let it the pawn go with a timed c4. Nothing new here, read Dynamic Chess Strategy by M. Suba. I know Andrew is writing a chess book, I have seen a brief snapshot of it. It is full of his best games written in a gutsy right in your face style. who at the moment is at the top of their creative ability. Black sacs a piece for a whole cluster of centre pawns. Look at this diagram. sacced back a piece for a couple of pawns. When and where is up to you. was unsound when he gets hit again with another piece sac. a2 and finishes it with the quiet move 38..Qb5. A wonderful entertaining game. Hurry up with that book Andrew. plays another brilliancy and has to find room for it. When these games go on the Chess Scotland site I recommend down loading it. I have only picked the games that suit me and this column. There are some other excellent and entertaining games played. Loads wee blunders and neat tactical tricks. This must have been the 3 games a day format. boards of the lower sections. I bet there are some classics there. Here are the plain moves of a few other good top five games. the state of the clocks. White resigned here but 52...Qe1 forces mate. 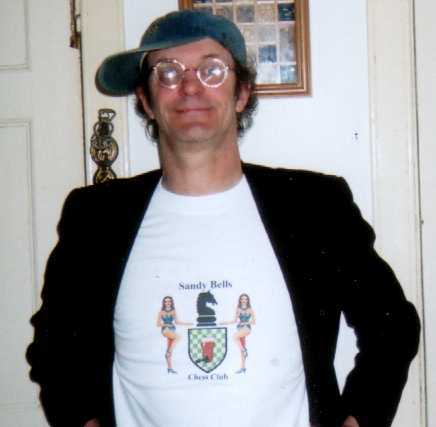 And finally here is me modeling the new Sandy Bells T-Shirt. That was just something I made up.